← Is ABC’s ‘The Neighbors’ Actually a ‘Meego’ Spin-Off? Perhaps the greatest compliment you can offer Parks and Recreation is that it’s no longer referred to as the quasi-Office spin-off (ignore the fact that we just did that in the first sentence). We’re now multiple seasons into an excellent run where Parks and Recreation has cast off the chains of its origins, found its own voice, become its own show, and surpassed its progenitor by all metrics save for Neislen ratings. We still maintain that Community is the best show of the night, but Parks and Rec has not been behind by much, outpacing The Office during its second season. 1. Stay the course. Things are going well, stick to what has worked while still trying to improve and evolve, continue to reveal more and more about the characters, from Leslie all the way down to Jean-Ralphio. 2. Figure out what to do with Rashida Jones. As we said, they’ve yet to successfully integrate her character like they have with Andy and Ron. 3. Be careful and judicious with the new guys (Rob Lowe & Adam Scott)…Our fear, however unfounded, is that these two strong male actors will throw off the dynamic of the show, with storylines focused on those two at the expense of the ensemble cast. Let’s now see how the show has addressed these recommendations. 1. Full marks here. The show has continued to give some of the best lines to the supporting cast, creating a living, breathing, colorful city the way that The Simpsons has done with Springfield. Specifically, P&R included Jean-Ralphio in one of the bigger subplots during the early part of the season, Tom’s failed attempt to start up the multi-media conglomerate Entertainment 720. Yes, Jean-Ralphio disappeared after E:720 disbanded, but he made a welcome return in the season finale, and we feel confident that he, along with our other favorite periphery Pawnee residents – Perd Hapley, Joan Callamezzo, Detlef Schremp – will continue to play their part as long as the show continues. As far as the main characters, we’re pretty satisfied with how they’ve developed. Leslie Knope’s run for City Council allowed her to reveal even more vulnerability along with even more resolve. Likewise, the campaign has given Adam Scott’s Ben an opportunity to demonstrate some heart along with more competency, after being made to appear somewhat inept, at least out of his element, prior to this storyline. Ron Swanson has obviously become a breakout character – due in no small part to Nick Offerman’s own idiosyncrasies – but the show should be careful about going to that well too often. Yes, he delivers the majority of the shows most quotable lines, can provide comic relief just as easily as he provides a conscience, and is probably a joy to write for, but like all rich things, moderation is key. They’ve done a good job not submitting to their indulgences thus far, and let’s hope that continues. If we had one complaint, it would be the quick, almost inappropriate courtship of Andy and April in Season Three. Yes, they were cute together, yin to each other’s yang, and certainly April is a better match than Ann, but the last we knew April was a teenage intern and Andy was a full-grown, albeit fully incompetent, adult male. More than their budding relationship, it was their shotgun (but without a baby) wedding that felt the most artificial, the most inorganic. But as the show has progressed (and as it’s aged up Aubrey Plaza with better clothes and more makeup), the relationship has grown more palatable, adorable even. 2. And here, still, is our big issue with the series, the thorn in its side that keeps it from being darn near impugnable: they’ve yet to truly find something for Rashida Jones to do, or someone adequate to pair her with. Her relationship with Rob Lowe’s Chris was fine, but felt more like the result of a numbers game and it lacked any real chemistry. Her current (?) on again-off again dalliance with Tom is laughable, and, well, we guess it should be because it’s played for laughs. However, at this point, the character of Ann Perkins deserves more than that, deserves to be more than a joke; if she can’t do better than Tom, then she might as well have stayed with Andy. Basically they’ve made the character an utter loser in love, while she’s the voice of reason otherwise. But, perhaps, that’s the problem, she keeps being defined by her romantic relationships, or lack thereof. Maybe they can find a way to give Ann a purpose that is not related to her being unlucky in love (and other than working for the Department of Health). It’s frustrating that they have someone so pretty, so charismatic, so talented, and yet she’s relegated to third or fourth banana, someone who’ve they’ve frankly made out to be pathetic. She’s better than that, and the show is better than that. But until Parks and Rec can rectify this consistent failure, it’ll never quite get an A+ from us. We’d include a classic Ann Perkins clip here, but no such thing exists. 3. No complaints here. Adam Scott and Rob Lowe have integrated seamlessly into the fabric of the show, and their presence has never felt forced and nor has it obscured the other, more senior characters. Are they essential? No, especially Lowe’s, who’s health-obsessed Chris may be wearing a bit thin, but they’re certainly welcome citizens of Pawnee. When the show aired its season finale, “Win, Lose or Draw” last week, it had not yet been picked up by NBC for a fifth season, so, in essence, it had to serve as a series finale, if necessary. We don’t know if the writers had this in mind, but we saw at least one tweet from a respected TV critic who noted that if this episode did need to stand as the series finale, then it did a fine job of it. And, to a degree, we agree. Leslie wins the election and begins to realize her dream of governing, beginning a journey that she hopes will end at 1600 Pennsylvania Avenue, and she does so with the help of her co-workers, her friends, and her boyfriend, a love that she’s so secure in that she urges Ben to accept a (temporary) job in DC. This was not a cliffhanger, and there are no loose ends that need tying up. 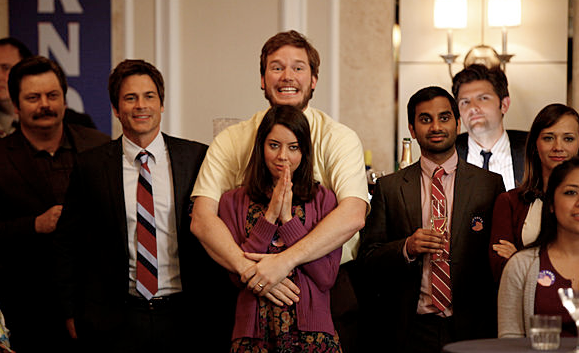 If this was it for Parks and Recreation, we all could have walked away satisfied. But “Win, Lose or Draw,” was not the end of the line, we’re grateful for that, because we firmly believe that Parks and Recreation still has more story to tell. After the first season, the show made a decision to expand their scope beyond turning a dangerous pit into a local park, and that allowed the show to develop and flourish. Just because Leslie will no longer be working in the Parks Department, doesn’t mean that the show shouldn’t or couldn’t continue. It’s moved way beyond Parks and Recreation now. Now it’s just a name. Just like Community found its footing when it stopped being just about a Joel McHale at a Community College, and in the way The Office is not really about “the office” anymore, and hasn’t been for a long time. So there’s just as much, if not more, story to tell now that Leslie has moved up to City Council. And if they can find a way for Ann to stay involved at the Parks Department, then we’re sure they’ll figure out something for Leslie. Speaking of Ann, we also want the show to continue because we desperately want them to find a role for her. Or, if not, write her out, because that might be better than another three seasons of aimless Anness. And will still hold out hope for the return of Mark Brendanawicz. When Paul Schneider left the show, Executive Producer Mike Schur said that they hoped to bring back Brendanawicz down the road, and we’ve always kept that in mind. Has Adam Scott been a better, more dynamic presence on the show? Perhaps. Certainly a better love interest for Leslie. But we always appreciated Scheider’s Brendanawicz, and his pragmatic, even keel nature. And maybe that’s what (or who) Ann Perkins needs. He’s not as fun as Tom, but certainly more capable and mature. At the very least, his return – whether it’s next season or in the series finale – would bring the show full circle, and we’re a sucker for that shape. Regardless of what happens down the road with Parks and Recreation, it’s earned the right to continue. It still feels like it’s hitting stride. As we’ve seen with The Office, shows do have a tendency to slide as they put on the years, but while Parks and Recreation may have peaked this season or last, its approval numbers are still sky-high. Oh, and more Paul Rudd!